Gather ingredients and craft potions! Entry for the 1roomrpg gamejam. Good job. The game plays really well and satisfying. The transition between two floors is a neat addition too. That was pretty fun! Nice cut-scene and well animated. A little buggy tho... the dash does not always work as I expected. Also I got stuck in the pit in the screen right after I got the bow. I think you need a restart button after the Game Over. About the attack, the hitbox is fine, but the sword is very small. So you should make the sword sprite a little bigger. The jump physic is a little weird too. The jump force is a little brutal, you should try to smooth the curve. That was an audacious choice to split an already little screen in two "games". Neat GB graphics. Good job. Neat little puzzle game. Well done. Smooth controls and physics, it feels great to play. I wish my gamepad works with this game! Scary! The sounds and the character you encounter make it a good unsettling ambient. You select them in the turn list. Sorry if it was unclear ! As I said before, nice pixels, good job to the artist! I think the camera should be oriented so the character appears in the corner. Because the view is narrow, it's hard to anticipate enemy. Overall, the controls are pretty smooth and it's fun to play. I also like the message boxes. Readable and their are not stopping the player movement, so it's not breaking the game flow. Good job! The first time I launch the game (linux build) it seems it was detecting the "right" button ad the camera kept rotating. It was fine the second launch! So there is just dummies and a door? The wall make it difficult to see whether there a path or not. However, you did a good job fitting the UI in the low resolution (the portraits + the menus). I think you should had some checkpoints, because it's frustrating to fall all the way down to the beginning and having to start over again. Thanks! Hack ability switches 2 "actors" places in the turn list. Clever game mecanisms, and the graphics are candies for the eyes! I like the catchy music too :p Solid entry! That was hard! I didn't beat the game... There was just one orc on the board, I corned him and then the game froze (probably because he couldn't move). Nice minimalist strategy game ! I get some Nuclear Throne vibes on this one! :p I had fun playing it, gg. I just tried again on Chromium, and the controller worked this time! I'm on Ubuntu and I was playing with Firefox 61.0.1 yesterday. I have a Logitech f510, which is similar to a Xbox gamepad. That's a charming little game! A little confusing, I gave up the search at $4.75, but I liked the graphics and pixels. Really fun! It's both fun to play and really good looking. The character jump and land animation really add a good feedback to the experience. I stupidly died at the second boss :D I wish I could play it with my controller (it wasn't detected, I was on the browser version, I don't have windows, ), I would enjoy it even more! 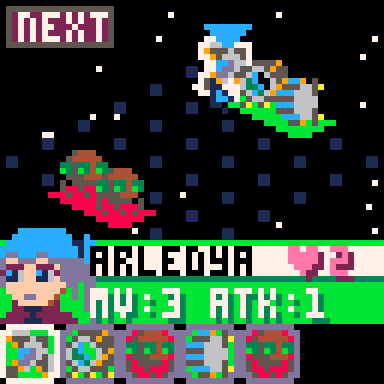 #LOWREZJAM 2018 community » Devlogs · Replied to Gawain (DarkGriffin) in Let's rock that Pico8 thing, oh dear, what am I even doing. Good job on making and finishing it! Thanks. Stuffing the UI in a 64x64 res was indeed a challenge ! Dev status: done. Play it here. This game is a turn based tactical game. You control 3 spaceships, to complete a mission you need to take down every enemy spaceships. The game is broken down in 12 missions (selected from a list of ~ 40missions), with increasing difficulty. Ship 2 : Support. Move slowly, cannot attack but can grant a shield to a friendly unity. A shield prevents any damage once. Ship 3 : Move moderately fast, has an attack ability. Also has Hack ability. Hack allow you to manipulate turn orders by switching two characters places in the turn list. Planets are also friendly units. They can launch a nuke, which is a powerful attack that strikes at the beginning of their next turn. #LOWREZJAM 2018 community » Devlogs · Posted in Mystic (not) Roguelike. Looks great. I'm interested in playing it! #LOWREZJAM 2018 community » General · Posted in It exists a official Discord or something like that? T'es arrivé loin déjà! T'as mis combien de temps? Le passage secret que tu cherches est caché dans la salle juste avant de passer à la zone de droite (où les couleurs changent). Si t'as 9 pièces, ça veut dire que tu as déjà découvert l'astuce pour trouver le passage ;) C'est vrai que faut tâtonner, mais y'a un petit indice visuel. Pour les combats, tu utilises le dash pour esquiver les hits? Probablement si tu est arrivé jusque là. En tout cas la dash est sensé compenser la lenteur du personnage, t'as le temps de dash juste avoir mis un coup de lance, même avec le délai post-attaque. Mais effectivement il faut que j'ajuste le patern des "grands" robots, le timing pour les attaquer est un peu court et assez compliqué à avoir. Merci pour les feedbacks, je prend note! :D et bonne chance si tu tente de finir le jeu (avec les 10 pièces).